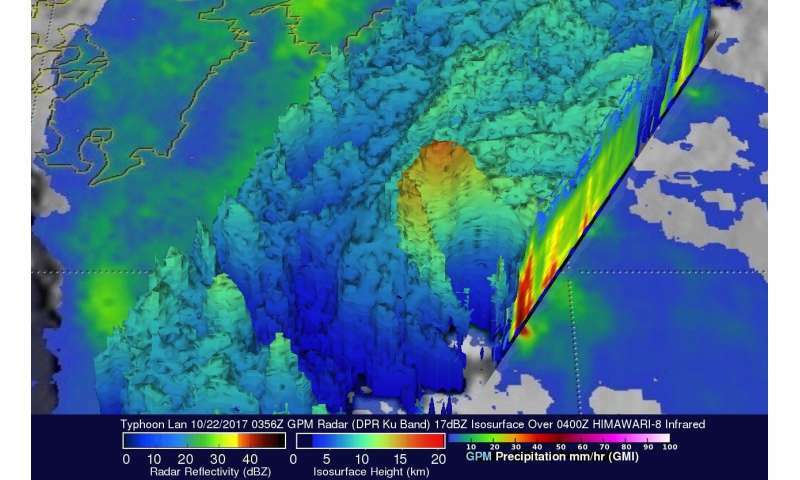 When Typhoon Lan made landfall in Japan on Oct. 22, the Global Precipitation Measurement mission core satellite or GPM analyzed the storm and added up the high rainfall that it generated. 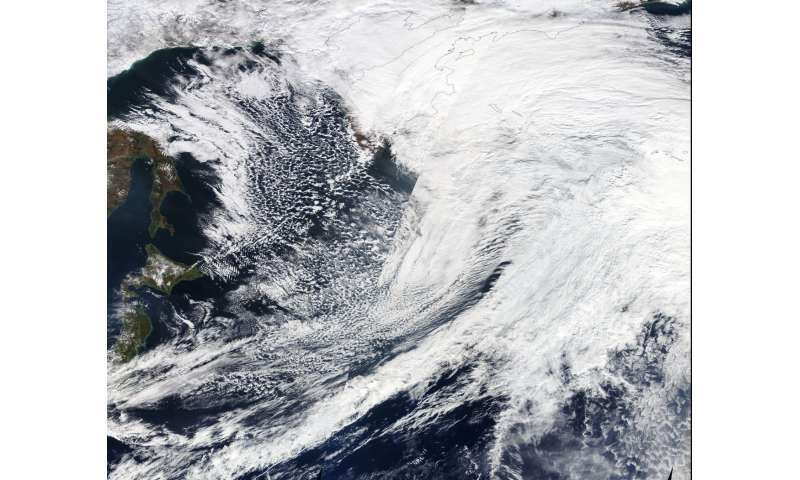 By Oct. 24, Extra-tropical cyclone Lan moved east into the Bering Sea and generated storm warnings. Typhoon Lan caused flooding, landslides and the death of at least seven people when it hit Japan early Monday Morning. The powerful typhoon was accompanied by high winds and extremely heavy rainfall. Rain totals of 800 mm (31.5 inches) were reported in parts of south central Honshu. Wind speeds of over 106 knots (121.9 mph) were also reported. On Oct. 22 at 1:56 a.m. EDT (0556 UTC) the GPM core satellite had an excellent view of Lan as the typhoon was approaching Japan. Data collected by GPM's Microwave Imager (GMI) and Dual-Frequency Precipitation Radar (DPR) instruments were used to show the intensity of precipitation within typhoon. GPM's radar (DPR ku Band) measured rain falling at the extreme rate of greater than 297 mm (11.7 inches) per hour in the northwestern side of the typhoon's eye wall. An extremely large and intense thunderstorm feeder band was shown extending from south-central Honshu to the western side of the powerful typhoon. The northwestern side of Lan's eye wall was still intact but GPM's radar showed that dry air was moving into the southeastern side of the eye causing it to erode. 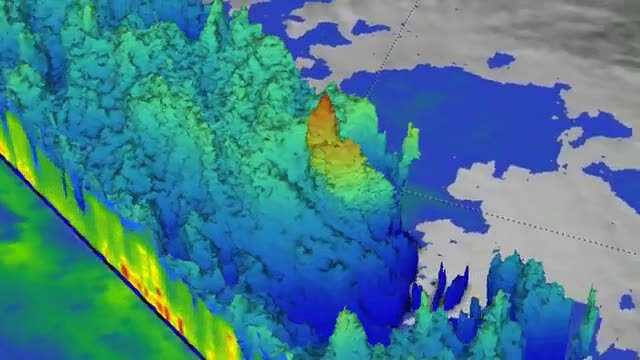 The GPM satellite's 3-D Radar data (DPR Ku Band) were used to probe the structure of precipitation around Typhoon Lan's eye. Those data revealed the very powerful and tall thunderstorms that were located on the northwestern side of Typhoon Lan's eye wall. The 3-D imagery also revealed a break in the southeastern side of Lan's eye wall. GPM is a joint mission between NASA and the Japanese space agency JAXA. On Oct. 24 at 4:29 a.m. AKDT (Alaska Daylight Time), the National Weather Service in Anchorage posted an Offshore Waters Forecast for the Bering Sea Offshore for west of 180 and east of the International Dateline. The forecast included a Storm Warning through Oct. 24 and included rain and winds during the day from the east between 45 to 60 knots. Seas are forecast to be 22 to 37 feet. At night, winds are forecast from the northeast between 40 to 55 knots with seas 24 to 38 feet. Extra-tropical Cyclone Lan is expected to move in an easterly direction through the Bering Sea toward Alaska.